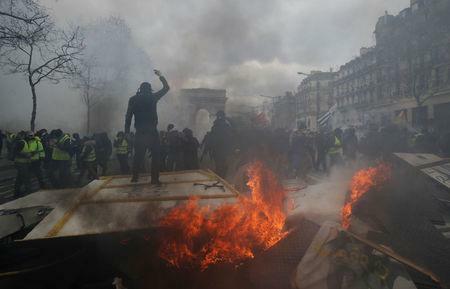 PARIS (Reuters) - Rioters set fire to a bank and ransacked stores on Paris's Champs Elysees avenue on Saturday, in a new flare-up of violence as France's yellow vest protests against President Emmanuel Macron and his pro-business reforms entered a fourth month. Police arrested nearly 240 protesters as rioters looted stores around the Champs Elysees and wrecked the high-end Fouquet's restaurant. The canvas awning was later set on fire of the swanky brasserie, known in France as the place where conservative Nicolas Sarkozy celebrated his presidential election victory in 2007. Macron cut short a weekend ski trip in the Pyrenees to return to the capital on Saturday night for a crisis meeting with ministers. "We are attached to constitutional rights, but we've got people who through all means quite simply want to make a wreck of the republic, to break things and destroy, running the risk of getting people killed," Macron said. "I want us to very precisely analyze things and as quickly as possible take strong, complementary decisions so this doesn't happen again," he told ministers. Police said 42 protesters, 17 of their own officers and one firefighter were injured. The interior ministry estimated 10,000 people had participated in the protest in Paris, compared with 3,000 on the previous Saturday. Nationwide, protesters were estimated at 32,300, compared with 28,600 last week. Interior Minister Christophe Castaner said that although the protest was relatively small, there had been more than 1,500 "ultra violent" people out looking for trouble. "They decided, perhaps as a swansong, to come attack - and I use their words - Paris," Castaner said, adding that more than 1,400 police officers were mobilized. A separate, peaceful march against climate change through central Paris drew as many 36,000 people, police estimated. Some 145,000 people marched nationwide. Yellow vest protesters had promised to draw bigger numbers to mark the fourth month since the movement erupted in mid November over since-scrapped fuel tax hikes and the cost of living. Named after the high-visibility vests French drivers have to keep in their cars and worn by protesters, the revolt swelled into a broader movement against Macron, his reforms and elitism. The 41-year-old former investment banker also launched a series of national debates aimed at determining what policies people want the government to focus on. Saturday's protests coincided with the end of the debates.